We especially like contesting on the VHF/UHF/SHF bands. Over here in Germany we got so called "major contests" every first full weekend in March, May, June, July, September, October and November. March, May and July are all bands from 144 MHz up to "light" while June is microwave only (1296 MHz & up), October UHF/SHF (432 MHz & up) and November being 144 MHz CW only (Marconi Memorial Contest). 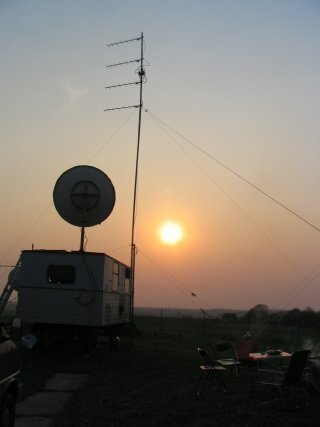 As propagation on the VHF & up bands is usually line of sight we do all our contesting from a small hilltop about 80 m a.s.l. The QTH is about 90 km north-east of Berlin, the German capitol, and about 10 km west of the German-Polish border. Being that far away from the main activity centres we'll never be able to win a contest on a single band. Therefor we concentrate our activities on the German "Contest Pokal" which is scoring on a multi band entry level. In 2005 we placed 3rd overall! That's been our best result ever. We are currently QRV on 144, 432, 1296, 2320 and 10368 MHz. To get more info on our equipment or claimed scores of recent contests please feel free to follow the links on the left-hand sided navigation bar. Hope to see you in the future during a contest!